Lok Sabha elections 2019: The BJP and the Asom Gana Parishad (AGP) decided to form an alliance after a long meeting on Tuesday. GUWAHATI: Two months after severing ties with the ruling BJP in Assam over the contentious Citizenship (Amendment) Bill, a regional party in the state, the Asom Gana Parishad (AGP), has returned to the alliance ahead of the national election. In a late night development, the two parties decided to form an alliance, the contours of which would be decided in a day or two. The decision was taken after a long meeting between senior BJP leader Ram Madhav and the chief of the regional party. 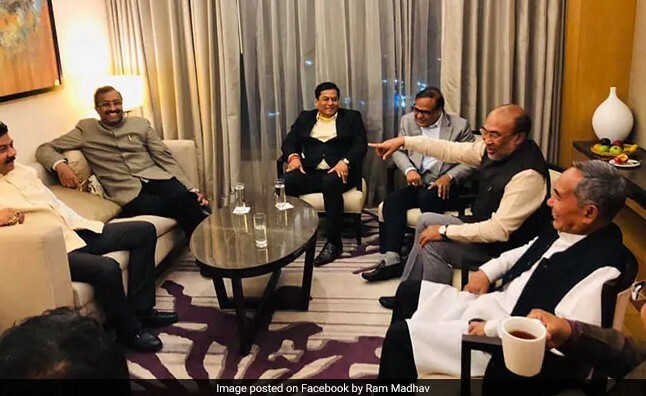 “After discussion, BJP and AGP have decided to work together in the coming parliament election in Assam to defeat Congress,” Mr Madhav told reporters after the meeting. “It was a hectic day of parlays yesterday in the North East,” he wrote. On January 7, the AGP withdrew its support to the BJP government in Assam in protest against the centre’s decision to go ahead with the Citizenship (Amendment) Bill, which seeks to grant nationality to non-Muslims from Bangladesh, Afghanistan and Pakistan after six years of residence in India. The main opposition in Assam, the Congress, had been campaigning hard over the fallout of the Citizenship (Amendment) Bill and had said that if voted to power, it would scrap the controversial bill. The BJP had stated that if it returns to power, it will bring the bill again in parliament. In 2014, the BJP won seven out of 14 Lok Sabha seats in Assam, the Congress and the All India United Democratic Front have three lawmakers each and one member is an Independent. The two BJP allies, Bodoland People’s Front and the AGP, have no representation in the Lok Sabha. Polling for the general election will be held in three phases in Assam, on April 11, 18 and 23.